Few things are more enjoyable than sitting by a fire with friends and family. Our handmade fire pits are custom made to fit your outdoor space and will provide years of enjoyment. Contact us to design a custom fire pit or visit our showroom at Chicago Roof Deck and Garden to view our work. Outdoor spaces are defined by the materials they are framed in. Our concrete panels are a dynamic and incomparable medium for exterior applications. Each panel is hand-cast and no two panels are alike. A kitchen is the fundamental ingredient for successful outdoor entertainment and our concrete countertops are the perfect surface to inspire your outdoor kitchen. At over two inches thickness our countertops offer an unparalleled robustness while still preserving their lightweight characteristics. 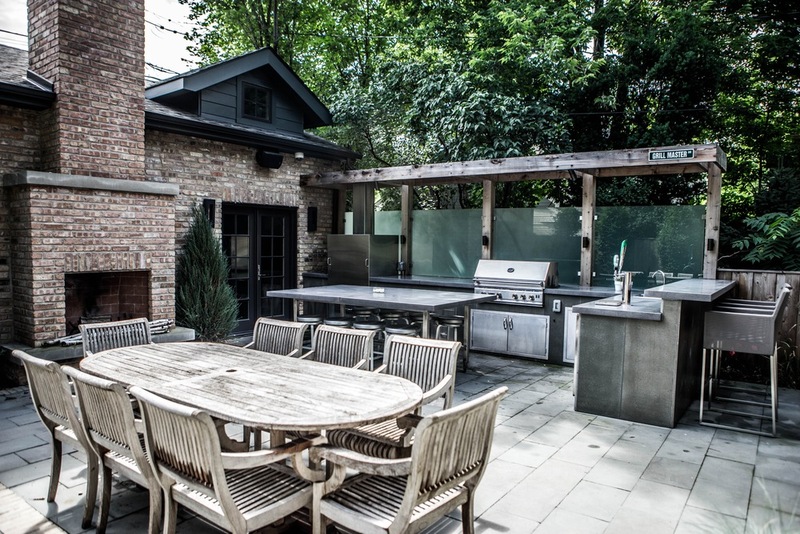 Working along with the homeowners we helped transforms this outdoor space into the chefs dream outdoor kitchen and entertaining space. Complete with grill, icemaker, refrigerator, and dual tap keggerator this space is the toast of the neighborhood. We designed and fabricated custom concrete panels and countertops that mirrored the design intent of the interior while still giving the space that 'outdoor' feel. Each concrete piece was handcrafted by our artisans using mindful ingredients and sustainable practices. We have found some designs to be suitable for a variety of spaces. Our standard pieces offer time tested forms and can be the centerpiece of any outdoor space. If you have a vision for your space that requires a custom piece please contact us and we will help you design your ideal concrete piece.